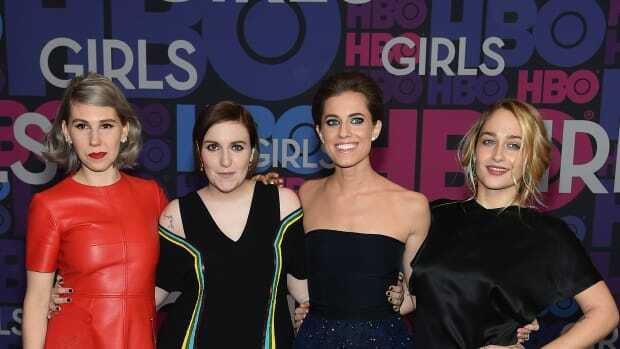 On Monday night in New York City, it was the girls of HBO&apos;s Girls&apos; time to shine. And shine they did: The show&apos;s cast and an impressive list of notables headed to Lincoln Center to celebrate the premiere of the series&apos; third season. Lena Dunham -- who wowed in a glittering Rochas gown -- was all smiles with co-stars Jemima Kirke, Zosia Mamet and Allison Williams, who looked characteristically perfect in an embellished Dior dress. Lincoln Center, home of New York Fashion Week, was an appropriate venue for the event, considering that a sizable chunk of the industry turned out to show Girls its support. From top-tier designers -- Cynthia Rowley, Zac Posen, Nanette Lepore -- to models and editors like Joanna Coles, it&apos;s clear that Dunham and Co. have officially won over the fashion world. Even Anna Wintour, who arrived in a white Prada fur, was mingling among the crowd at the replica subway station where the party was held. Did she and Dunham toast to an upcoming Vogue cover, perhaps? We&apos;ll have to wait and see. Read on to see the most stylish looks of the evening, and tune in to Girls when season three begins this Sunday. The countdown to Jan. 12 is on. The HBO hit series returns on Sunday, January 11.